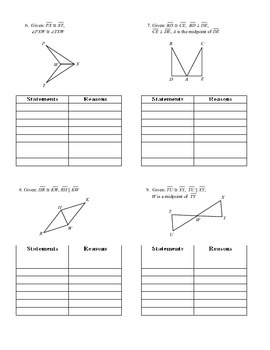 Once your students have learned Side-Side-Side Postulate and Side-Angle-Side Postulate, they are ready to really begin building their own proofs for congruent triangles. Get them to take ownership of the process with this 2-day common core collaborative activity. 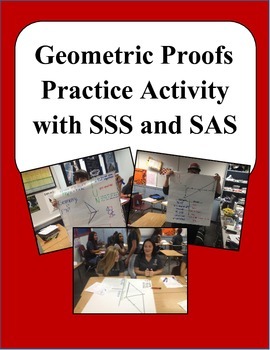 This is a perfect activity to help build confidence in developing proofs, right before moving on to ASA and AAS. Day 1 - you guide students through problems 1, 2, and 3 to remind them and teach them about your expectations for proofs. Then students work with partners as you circulate and help on problems 4 through 9. Day 2 - You put students in groups to discuss, polish, and present one problem from problems 4 through 9. 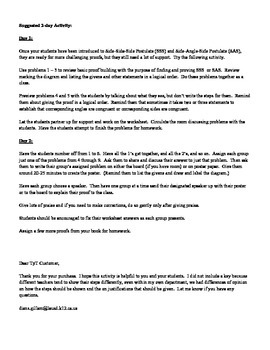 As each group presents and explains the problem, you can offer support and guidance, and students in the audience can fill in parts in which they struggled. 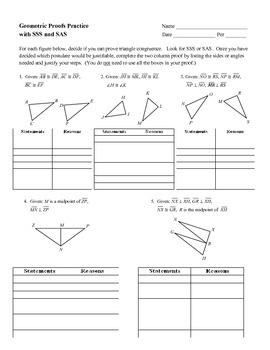 This lesson is full of support and differentiated instruction for a regular or low level Geometry course. Helps meet the yearly goal and objective of having students take responsibility for their learning. You will love the collaboration that takes place on the second day. And by the end of the activity, most students are much more confident about their ability to generate a proof. *Note: The thumbnails above dropped some of the lines from the actual document. The actual document you download has all of the lines on the charts.